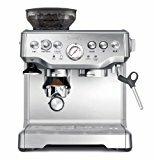 For the lovers of espresso looking for a fairly priced home or office coffee brewing machine, Breville BES870XL Barista Express Espresso Machine should be your first choice. This top range elegantly crafted machine has a plus side of making your kitchen look more sophisticated and stylish besides the quality coffee brew it produces. This is because of its high-grade aluminum and zinc cast which fits in place perfectly with other stainless steel kitchen cutlery and electronics. Once you set your eyes on this espresso machine, your mind runs through the making process of each cup imagining every single bit of the process until the part you fantasize your thick sweet brew trickling down from the nozzle. This is meant to make the machine durable as well as stable. This cast does not compromise the quality of the produced espresso in any way but rather ensures that no dirt or contaminants linger on it. It has rubber grips on the bottom to ensure the machine does not move while grinding the beans. With the Barista Breville Express espresso machine, you don’t have to be there to rotate a knob or a lever to grind your beans. All you have to do is push the portafilter into the cradle then select the grind amount that you want on the electronic dial and wait for the ground beans go right to the filter and then automatically stops when the preferred amount has been dispensed. This machine has a clean 67 Oz water tank that can be removed. This tank is filled from at the top and has optional water filters which are replaceable to ensure purity of water at all times and to ensure there are no mineral deposits inside the water tank. These dials ensure total control of the machine by the user. The dials enable the user to set the grind size, the amount of grind from the finer particles to the coarse particles and full loads to single shot and temperature settings. These dials are clearly labeled to ensure ease of use. The machine also has a button for the filter size to change from a single wall filter to a double wall filter basket for the perfect brew produce. This is where the components of each bean are smoothly ground to ensure the entire flavor and every ounce of aroma is finally put into your cup. With the new technology incorporated to this Express espresso machine, the grinder maximizes the surface area of the grind to ensure fine and same size particles are produced. This machine is built to go to standby mode after an hour from the last use. It then goes off if three hours go by without it being used. This feature ensures that energy is conserved while the machine is not in use. This piece of the Breville BES870XL Barista Express Espresso Machine allows you to let down enough amounts of your fresh beans into it, sit back and watch it fasten into the stainless steel integrated conical burr grinder. The hopper locks to ensure safety but can also be removed in case of storage or cleaning. The Breville BES870XLBarista machine has a 15-bar triple-prime pump that pre-infuses the ground coffee beans in order to maximize the flavor. In turn, the pressure gauge shows the extraction pressure in the pressure gauge display so you can keep an eye on your barista making skills over time and perfect the art of making quality beverage using this machine. A great feature of this machine is that if it is for home use it can be programmed to make only one or two cups of brew in one use. The preset setting is of 30 ml cup but there is another feature that allows the user to control the amount of liquid going into each shot hence you can control the flavor too. However, to do this one has to get used to tuning the machine’s pressure while brewing. The Breville BES870XL Barista has a built-in PID that helps to maintain the water temperature at an ultimate 200F as the extraction process is underway. You can also increase or decrease your preparation temperature up or down but only to 4F in 2-degree increments to ensure that you dial in precise shots. After that, an auto-purge function is responsible for restoring the machine to an optimal brew extracting temperature. The Breville has patented some stainless steel razor dosing tool that trims up your porta-filter and post-tamp to ensure consistent shots are made every time. This enables the user to make precise shots always. The steam wand in the Breville BES870XL Barista Express helps you to heat and texturize milk such that you can let down pressurized cream foam and get to play with it trying out creative styles to a nice cup of coffee brew. It is steady since the aluminum and zinc cast brings stability. It has a base with grip hence as the machine is at work it doesn’t move. Stainless steel aluminum casing makes the machine look shiny and clean as well as elegant. Comes with storage compartment for keeping cleaning tools. The Dispenser has a hot water and steamer. Accumulates sludge despite efforts by the manufacturers to upgrade the drip tray. Makes a mess before the coffee actually tamps down. If you are looking for the best unit to lean on for money, and have espresso and coffee making that gives us satisfaction choose this one. Below are some of the reason why we want you to choose this espresso machine. It has an ability to get only excellent and consistent results is ensured by the possibility to grind the same amount of coffee dose each time, tamping it and then passing the same water amount through it. You can easily adjust easily adjust the settings to get your perfect cup of espresso. In addition, It has also volumetric control that can produce a single shot or even Double shots of espresso. Users can manually control the extraction process and create their pre-set extraction times. This is a product that is different to other coffee makers in which the in-built burr grinder allows you to enjoy consistent grinding, that can help you to create your perfect tasting espresso. If you wish to have different milk-based coffee drinks, including cappuccinos and lattes. The steam wand offers enough pressure to provide you with silkily steamed milk. Compare to the average entry-level device, the price of Breville BES870XL is a bit higher. But consider such extras as an inbuilt grinder and consistency features. They take your espresso-making skills to the next level, and its value is worth the price paid. Comparing the pros to the cons and tons of dozen customer reviews, the barista Breville BES870XL is the best espresso machine one could acquire for home use. It is fast, pretty neat and easy to use. This machine is sure to serve the needs of people who love brewing perfect coffee beverages as well as the aspiring baristas. It is easy to use with clearly labeled functions and the features favor beginners and intermediate users. It can also make other beverages like tea and ordinary coffee and is fairly priced in relation to its great capabilities.